Discussion in 'Picture Gallery' started by AustinD, Feb 13, 2008. Does anyone know of any cool ones? Periodic table/molecular models/any neat looking stuff? I couldn't find much that looked good at all. isn't that the cover to The Strokes - Is This It album? ME TOO....ahhhh just thinking of ochem makes me cringe. its the smashing of an elementary particle in a bubble chamber. the lines you see are tiny pieces of the particle (quarks etc?) as they decay and move about in pure nuclear fashion. the odd coloring is false. This wallpaper is definitely my favorite one. Do you know where I can get a higher resolution version? If anyone wants the wallpapers I posted send me a PM with your e-mail and I'll send it as an attachment. They're much bigger than what comes up when you click on them. mycupoftea has left a message sayin 2 send him a pm if u wnt those pics in higher detail. How do I send a PM? lol. Thanks. Just send me a PM by clicking on Private Messages in the top right hand corner where it says "Welcome, <insert username>". My high school chemistry teacher has the "Carol" poster in his room. 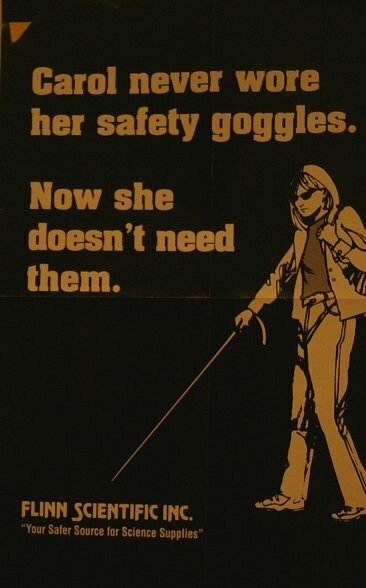 Its better than the "Lab Safety" poster with a yellow Labrador retriever wearing goggles. mycupoftea, this forum allows quite a generous amount for attachments, if you don't mind, might you just attach them to a post here? It may make matters a lot easier and others who don't feel like PMing and emailing for it can still get them. I love the Erlenmeyer flask and the cup of fire and water.